Home » Website Building » SEO » How to use Disavow Links Tools in Bing Webmaster Tools? The important aspect of off-page SEO is to build links pointing to your site and these links are one of the factors deciding the ranking of your pages in the search engines. At the same time most of the webmasters start building the links without limit before finally getting penalized by search engines due to unnatural links pointing to your site. Once you realized there are manipulated inbound links which you are not able to remove by contacting site owners then use disavow links tool available in Bing webmaster tools. Disavow links tool helps webmasters to inform Bing about the links not to be considered for Bing search engine ranking. How to Submit URLs for Disavow Links Tool? 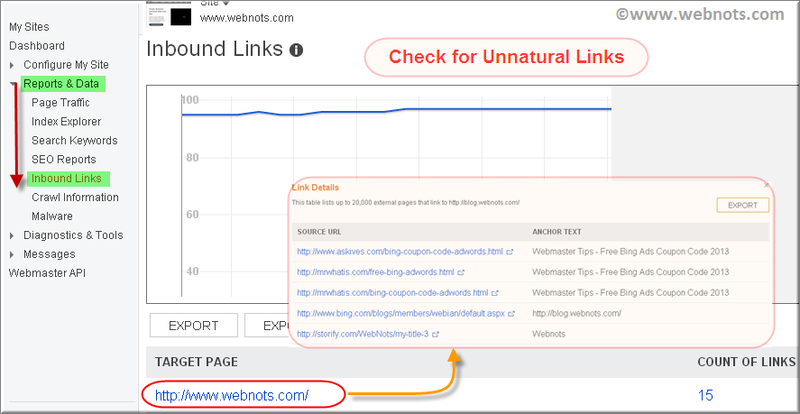 Login to your Bing webmaster tools account and select the site you want to submit the unnatural links. You must have added and verified the site in your account in order to use this feature. Go to “Disavow Links” option available under “Configure My Site” section. You can submit individual page, directory or domain which contains the unnatural links to your pages. Once you selected Page, Directory or Domain option available under the drop down menu, enter the URL and click on the “Disavow” button. You can see the list of disavowed URLs along with the date disavowed. In order find unnatural links pointing your site you first need to have an insight on total number inbound links to your site. Go to “Inbound Links” option available under “Reports & Data” section to see all the inbound links pointing to your site. You can see the list of your page URLs along with the count of inbound links. Click on the URL to see the detailed list of links that are pointing to the particular page. Check three simple factors to analyze whether these links will cause an issue for the search engines or not. If there are too many links with irrelevant anchor texts and not related to your linked page content then there is a high possibility that these links will be considered as a spam links by search engines. Select the URL disavowed and click on the “Delete” button to remove the link from the list. Click on the export button to download disavow links list in a CSV file format. Don’t expect immediate improvement in the ranking, it may take considerable time for Bing to recalculate the ranking of your site by excluding the submitted links. There is no limit on number of links for using disavow link tool. But ensure you use this tool after you tried to contact the site owners to remove the links. Disavowed links will be still showing in the “Inbound Links” section hence there is no way to confirm whether the submitted links are disavowed by Bing or not.